Relax in your very private hot tub, sunk into a 900 square foot wrap-around deck, surrounded by trees, and overlooking a beautiful swimming lake accessed from a dock by the property. This idyllic retreat is truly the best of both worlds; perfectly positioned for winter and summer vacations. Many windows and two sets of French doors opening onto the large wrap-around deck make this fully-equipped home light and bright in all seasons. Situated in a natural, rural setting amongst the trees, you can enjoy privacy while relaxing in the hot tub on the deck and enjoying the view of the lake. 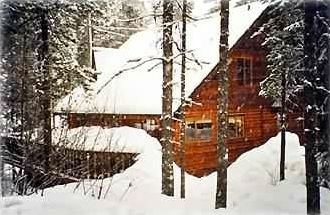 Cross-country ski, mountain bike, hike or walk - off the beaten track - directly from your door. The lake is regularly frozen in the winter and ice skating is possible. In the summer the lake is exceptionally warm and is perfect for swimming with access from the dock situated on the property. Walk or take your boat over to the two beaches on the lake. Snow and water toys are available for your use or you can use the private tennis courts. Located in a private, gated estate 15 minutes south of the Whistler Creek Gondola, with access to some of the best skiing in North America and the many fine restaurants, stores, and entertainment available in Whistler. From this rural, relaxing oasis you can enjoy everything that Whistler has to offer. Chartered accountant, originally from the UK,living in Vancouver since 1980. Currently CFO of a B.C. crown corporation. My wife Therese is a hairstylist and we have 3 grown boys, who have now left home. We searched throughout southern B.C. for a vacation home and were extremely lucky to find Pinecrest Estates. There are only 75 homes in the estate and the ones on the lake never change hands. It has the perfect year-round appeal. It truly is a slice of Canadiana for a Brit like me. Snow, skate and ski. Mountains, canoeing, swimming and forest. Away from all of the shops and crowds in Whistler, but close enough if you need it. Plus the logs ... so cozy. A mix of spices, sugar, salt, pepper etc ...again ....like being at home. Salad dressings, jams and sauces can be found in the refrigerator door. If you have it in your home ...we probably have it here. We call it the lake. Lovely and warm in the summer.